Who was Uncle Sid? Who Died 100 years ago today. Why do we not talk about our ancestors when we are young? Too often we only get interested when we have already lost those who could tell us more. 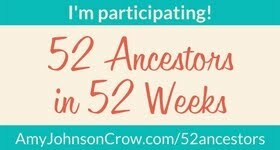 Only when I started to research my maternal line did I discover that my grandmother had more than one brother (see my earlier post Mother's Uncles). That being said Uncle Sid (Sidney Herbert Compton 31 Aug 1893 - 28 Aug 1917) brother of my maternal grandmother was only 23 when he died 100 years ago. 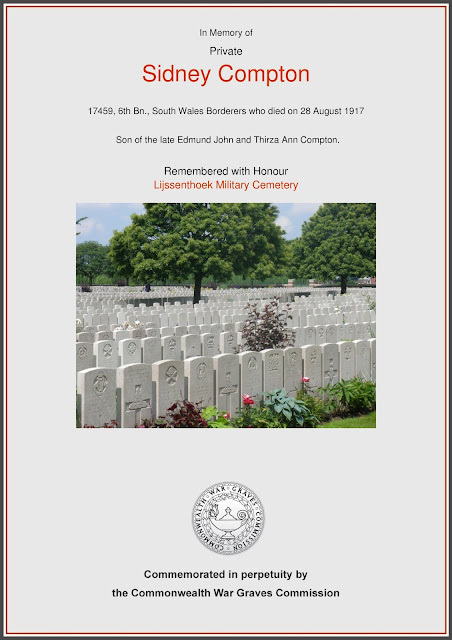 His younger brother Roy (Ernest Roy Compton 8 Jun 1895 - 23 Feb1917) had died at the age of 19 only a few months earlier. The certificate for his brother, which can be found here, does not even have the names of his parents (something I have plans to rectify). When I wrote my earlier post I could not be sure that Roy Compton was the person I was looking for but further records have confirmed my assumption was correct. This image was cropped from the original to show the entry of interest on the page. "UK, Army Registers of Soldiers' Effects, 1901-1929," database with images, Ancestry.co.uk (http://www.ancestry.co.uk: accessed 26 August 2017), image for Roy Compton, Record 725425 (1919); citing Soldiers' Effects Records, 1901-60, 1991-02-333, 434, 724001-725500, National Army Museum; Chelsea, London, England. This shows who received any money that was due to him for his service and I have found a record for Sidney in the same collection. "UK, Army Registers of Soldiers' Effects, 1901-1929," database with images, Ancestry.co.uk (http://www.ancestry.co.uk: accessed 26 August 2017), image for Sidney Compton, Record 578886 (1919); citing Soldiers' Effects Records, 1901-60, 1991-02-333, 337, 578501-580000, National Army Museum; Chelsea, London, England. I am fortunate to have been able to see a photocopy of a letter that Sid wrote to his sister Florence whilst out in France before his untimely death. You can see it in my earlier post mentioned above. We will never know if my grandmother received her half-a-crown or whether she wrote that she had received it. Even if she did he may have died before he got her letter. I have also seen a letter sent to my grandmother from a Miss D Phillips, who we believe to be Sidney's girlfriend, whom he has asked to visit my grandmother, in the childrens home in Bristol, where she has been living. I wonder what happened to his girlfriend who was living in Thornbury, Gloucestershire in 1917. Did she go on to marry and have children. There must have been many like her. How much would my grandmother have remembered of her brothers. When I was born they had been dead over 40 years and she had lost her own husband less than 2 years before I was born. She was only 6 years old when she was orphaned and how much would a six year old remember about her older brothers. Visits would be occasional as they involved travelling some distance. It can be difficult for children to approach older relatives to speak about people who they knew. Sometimes it can be all too easy for earlier generations to be forgotten. When lives have been cut short too soon it can be painful to think of what they have missed. In his all too short life Sid experienced things that nobody should have to encounter. His father died of tuberculosis and the following year he discovered his mother when she took her own life. The horrors of seeing friends die whilst serving in WW1 can be hard to imagine. Let us hope that death was a gentle release for a hero. Today is a day to Remember one who is gone but not forgotten.